When NASA-NOAA's Suomi NPP satellite passed over the South Pacific Ocean it captured a visible image of Tropical Cyclone Hola over Vanuatu. On Mar. 8 at 0230 UTC (Mar. 7 at 9:30 p.m. EST) the Visible Infrared Imaging Radiometer Suite (VIIRS) instrument aboard NASA-NOAA's Suomi NPP satellite showed the center of Hola was located southwest of the Pacific island nation of Vanuatu. The VIIRS image showed a well-rounded circulation center with bands of powerful thunderstorms wrapping into the center. The VIIRS image showed the northern and eastern quadrants of the storm extended over Vanuatu. 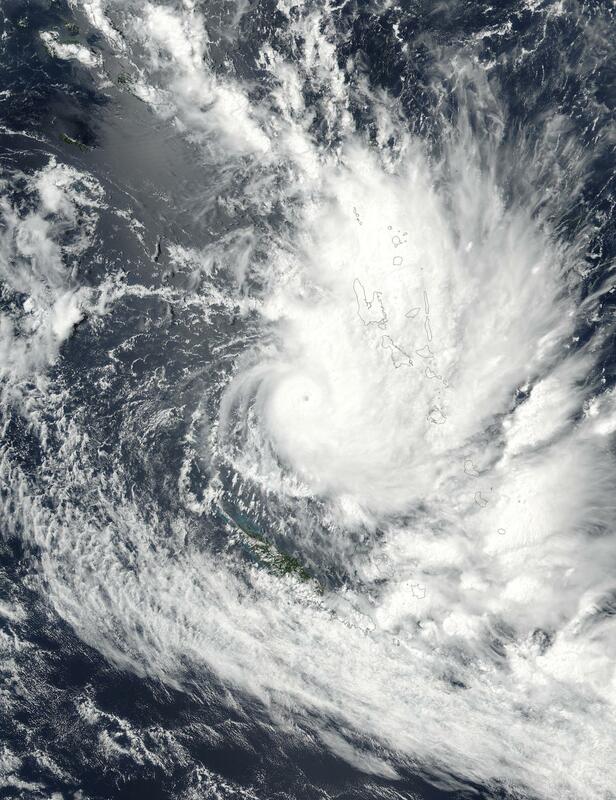 On March 8, warnings were in effect in Vanuatu and a pre-alert was posted for New Caledonia. In Vanuatu a tropical cyclone warning is in force for Shefa province. In New Caledonia the territory is on pre-alert, with the exception of Ouvéa, Maré and Lifou, which are on tropical cyclone alert 1. The pre-alert is expected to be upgraded to alert 2 within a day. At 4 a.m. EST (0900 UTC) on March 8, Hola's maximum sustained winds were near 109 mph (95 knots/175 kph). It was centered near 17.6 degrees south latitude and 165.4 degrees east longitude. That's about 166 nautical miles west of Port Vila, Vanuatu. Hola was moving to the south-southwest at 4.6 mph (4 knots/7.4 kph). The Joint Typhoon Warning Center forecast calls for Hola to move to the south-southeast over the next few days. The storm will intensify to 115 knots east of New Caledonia. Hola is then expected to weaken and become extra-tropical on approach to the North Island of New Zealand.